trompe l'oeil adj : creating the illusion of seeing reality; "the visual deception of trompe l'oeil art"
mu·ral (myrl) n. A very large image, such as a painting or enlarged photograph, applied directly to a wall or ceiling. adj. Of, relating to, or resembling a wall. Painted on or applied to a wall. mural·ist n.
trompe l'oeil murals Ceiling or wall paintings that create illusions in the decorative arts specifically designed to fool or trick the eye. 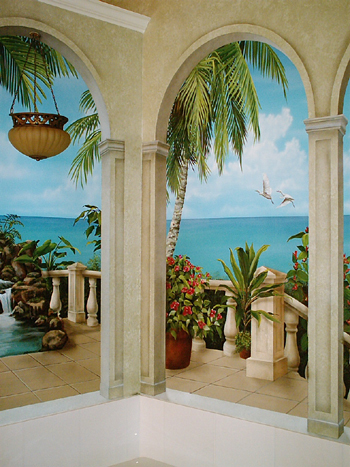 Art Effects paints murals using techniques in Trompe L'Oeil and faux finishing while creating illusions and effects. 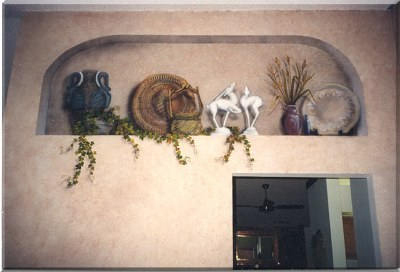 A Trompe L'Oeil Mural can be a unique addition to any room. One of these mural effects does not have to take up a whole wall. By using creative techniques with trompe l'oeil and faux finishes a simple smaller mural can have a larger effect then if a whole room mural had been painted. 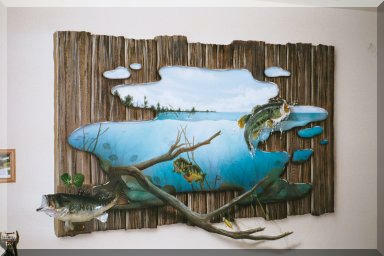 In our "one that got away" trompe l'oeil mural we created an effect to show off the trophy bass in the botton left corner. This example shows many techniques with faux wood, a mini mural, and a trompe l'oeil effect. 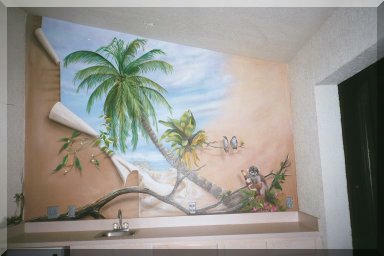 Another example of a Trompe L'Oeil Mural is our "monkey with a bottle trompe l'oeil". Here you see examples of a broken color glaze used for a faux finish on the wall, a peeled back, torn look for the trompe l'oeil effect and the mini monkey mural inside the picture. 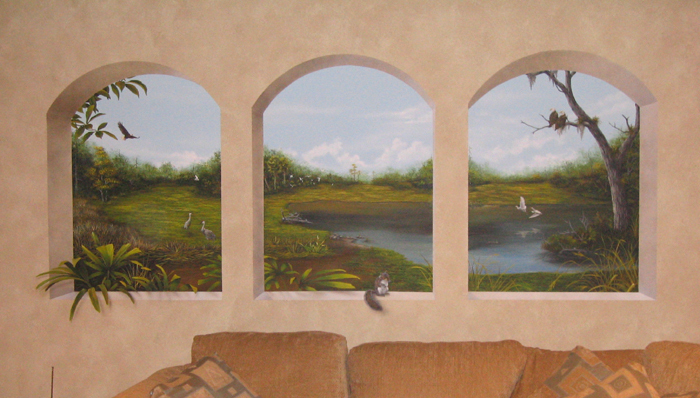 Notice how, like in many of our murals, we brought the limb out into the room, for an added trompe l'oeil effect.